Let me just restate my disclaimer: I have virtually no foreknowledge whatsoever of more than a few graphic novels or comic books, so I admit that it’s a little presumptuous of me to undertake the task of comparing the genres to another. But I have started down this path already in an earlier post and I promised more to come, so I am going to attempt to blunder on and hopefully hit something at least a little interesting. I may or may not revisit this in my next blog, but it is more likely that I will since Desireesw already took my idea about Truth(s)/relativity in Dream Country. Anyways, dialogue vs. speech bubbles. What’s the difference really? To start, let’s make an important distinction here: that for my purposes narrative will be a story as a whole whereas narration will refer solely to what a narrator, omniscient or otherwise, is telling the reader. Moving on. First off, with text boxes there’s the narration and then there’s speech and they are in completely separate bubbles. More than that, the speech bubbles usually connect to the person speaking the words. Often the shape of the speech bubbles is unique to a character, so that one can recognize who is speaking without actually seeing the speech bubble “coming from” a character. Speech bubbles are also generally unique in that they contain only what the character is saying; the rest is left to the narration box or the panel they are enclosed in. There is absolutely no difference here between what the story tells us and what the image demonstrates. 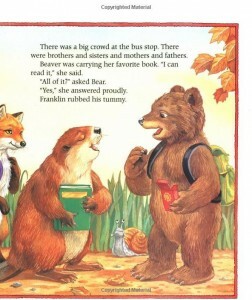 The narrative tells us Beaver’s tone of voice and the image shows us her facial expression. Description of speech is missing in comic books and graphic novels; they for the most part let the reader determine for themselves the feelings with which the words were said. Yet in children’s books, kids get the double whammy of the description and a picture of what is going on to influence how they interpret a work. “’Yes,’ she answered proudly” coupled with a haughty look on her face. Children’s books illustrations tend to look more like snapshots from a narrated pantomime rather than characters actually living out the story with us peering into their lives. it is typically indicated by bolder, maybe larger, possibly jagged letters, an angry facial expression, body language, and maybe a differently shaped bubble. Or maybe it only seems to some that the tone is angry, maybe some interpret that same emission as being shocked or surprised or frustrated. We’re not told exactly how the character is saying it so we are free to interpret it as we would any other speech by someone in real life: as we wish to. She had a lot to tell them! that combines the two methods. Sort of. Even though there are speech bubbles they’re still serving to illustrate what the narrative is saying, but here they are adding to its meaning rather than simply showing it. Maybe this just means that Martha Speaks is illustrated more complexly than Franklin. Maybe it means that children’s books are a lot more complex than I’ve been giving them credit for. Maybe Martha is the exception and Franklin is the rule. I think it would take a whole lot more research and examples to make any sort of conclusion about whether any of these hypotheses are right or not. Bourgeois, Paulette. Franklin Goes To School. Scholastic Paperbacks, 1995. Meddaugh, Susan. 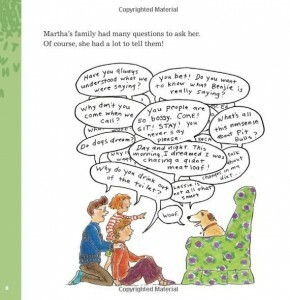 Martha Speaks Story Time Collection: Special 20th Anniversary Edition. HMH Books, 2011. Moore, Alan, and Dave Gibbons. Watchmen. New York, NY: DC Comics, 1995. Print. This is a really interesting post. The ways speech bubbles are used in comics was always something that irritated me as a child, but I was never fully able to articulate why I found them so off-putting. You went a long way towards explaining my childhood aversion with how you connected speech bubbles in comics to dialogue tags in children’s books, I really enjoyed your analysis of the biases inherent to the different genres. How do you feel about the different types of speech bubbles we’ve been seeing in things like Sandman? I love the idea of characters having their own personal type of speech bubbles! I can’t remember if I mentioned that in my last blog or not, but I really liked it in Watchmen and with Oneiros in particular. It helps me to navigate/figure out exactly who is speaking and to imagine that character as having a distinct voice in my head. I like the distinction you have made between narrative and narration in this post. I’ve noticed that, in most graphic novels, there is at least one bolded word in a given speech bubble – usually one per sentence. Since classic narrative has the luxury of using descriptive speaking verbs (e.g., he/she shouted, whimpered, squealed, etc.) and graphic novels do not, letterers must find a way to convey the “sound” of the speech. By bolding at least one word of a given phrase, the reader always knows what part of the sentence was emphasized, and the intended tone of the speaker is successfully conveyed. Of course artwork also plays a large part, as you mention in your post, but I’m surprised at how accurately I’m able to “hear” what the speaker is saying just by putting a few choice words in bold. I agree! 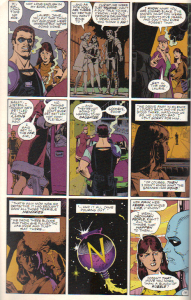 I found the bolding a little off putting in Watchmen because it felt like too many of the words were bold or they just sounded strange with more emphasis than the rest of the sentence, but it really does help to create that audio cue for the tone. This is really interesting and makes an interesting point in what makes a comic a comic. I love how you made distinctions between children’s books and comics, and the usage of speech bubbles to make distinctions between the two, but I can think of a few comics that bend the boundaries that you’ve made for classifying comic mediums. I was wondering what your opinions were on Hobo Lobo, the animated webcomic. There are no speech bubbles for that, rather the narrative is written underneath the stretch of images, yet this is considered a webcomic. It also employs the varying typography styles like you were describing for in Watchmen. Another example, which we saw briefly in 99 Ways to Tell a Story was the “Exorcise in Style (pg. 87), where the narrative is told mostly through text with minimal word balloons. I don’t necessarily think that comics need to have word balloons or even to show a narrative. And yes, I totally agree that children’s books are a lot more complicated than they first appear. 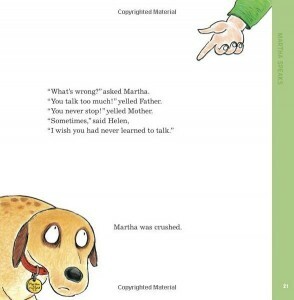 Also, Martha Speaks was one of my favorite books growing up too! Thank you for bringing these exceptions to my attention. I have basically decided (a little late) that comics, graphic novels, and even children’s books are wayyyy too innovative and different to make broad generalizations about the genres as a whole. If only I had realized that before I wrote two blog posts about them! Haha, oh well. I still think they led to some interesting connections even if they weren’t theoretically sound. There is absolutely no difference here between what the story tells us and what the image demonstrates. I agree that typically the image and the text reinforce one another in children’s books, but isn’t it going a bit far to say there’s “absolutely no difference”? Just to point out one difference in your example, the leaves on the tree tell me it’s Autumn, but the text doesn’t, at least not on this page. You’re right, I think I was pretty off the mark in both this and my last blog. As I implied towards the end of this one, they were based on pure speculation and it was obviously not very good speculation.